A few months ago, Google and Twitter agreed a deal that allowed Google to return tweets as search results. 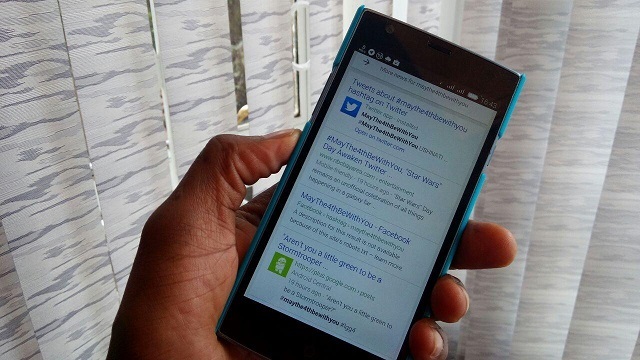 Google is now working on integrating the tweets into the search results including on smartphones. Google has begun showing relevant (and very recent) tweets when users search for certain trending topics.Some of the tweets appearing include the Carly Fiorina Domain trolling case. Currently, important and popular tweets appear when they pertain a users search term. The partnership is thus supposed to deepen Twitter’s activity on the same. When posting its financial results last week, Twitter said it plans to implement the project in May. Yesterday, one of the major trending topics on the social network was #maythe4thbewithyou which, is the Unofficial Star Wars holiday. After a search on Google, the same comes up as a news item and later some of the top tweets come up. Just last week, Google+ launched its Twitter account, four years after the social network came into existence, a sign on the renewed bromance. Below is an except of the same.